Cars won’t just be driving themselves one day—they’ll be communicating things like traffic conditions and the weather with everything else around them. Connected cars will be masses of sensors and outpouring radio signals, but if carmakers aren’t careful, this data sharing will open itself up to hacks and cyber threats detrimental to your personal safety. Traffic lights, street signs and even the cones at construction sites will soon be part of a connected ecosystem, giving and receiving information to make for smoother driving. The National Highway Traffic Safety Administration says removing human drivers from our traffic equation could potentially eliminate up to 80 percent of non-impaired crashes, meaning there’s a safety incentive to update our infrastructure to handle these communications. But such technological leaps are not without their risks. Cybersecurity isn’t a strong suit for automakers. In fact, many cars on the road today are laughably easy to hack into. Should these companies continue to fail to secure car networks, V2I communication could prove to be a dangerous tool. Though not mutually exclusive, connected vehicles are a different concept than simply autonomous vehicles, or driverless cars. While driverless vehicles scan the environment using their own sensors to keep the passenger safe, connected cars send and receive signals about the surrounding environment that can be used to help cars make safety decisions. In other words, a connected car isn’t just detecting what’s happening in front of it; it’s actively communicating with infrastructure and other cars to know what’s going on miles down the road, said Anurag Pande, associate professor of civil engineering at Cal Poly Universityand a researcher in the area of traffic safety. There are certain instances where a pure sensor-based approached in autonomous cars can’t predict hazardous behavior, said Collin Castle, the Michigan Department of Transportation’s Intelligent Transportation Systems Program Manager. Say you’re in a vehicle, and a car three cars ahead of you slams on its breaks — sensors wouldn’t know what happened until you saw the ripple effect of the vehicles being stopped. But if the car or the car’s driver could see that stop coming before it encounters the traffic, then safer, smarter decisions can be made. Not only would the flow of traffic improve, but such tech could save lives. “The big thing from an infrastructure perspective that we can provide is there’s certain scenario on our roadways where we feel that additional information from the infrastructure can really help make these connected vehicles and autonomous vehicles operate more safely,” Castle said. Here’s an example when connected infrastructure will come in handy: during changing traffic lights. All traffic lights are timed differently, and drivers won’t always know whether they can make it through a yellow light before traffic clears or when the turn signal is going to switch on. If the traffic light can talk to the car, it or the driver can make a better decision on what to do. Cadillac’s CTS model is testing out V2I doing just that—using communication tools built into the car to talk to traffic lights outside its headquarters in Michigan to help prevent the car from making red light violations, said Chris Bonelli, the coordinator of Global Advanced Technology Communications at GM. Federal and local governments are also experimenting with putting connectivity in their infrastructure. Michigan’s DOT is testing one of the nation’s first “connected work zones” on a stretch of I-75 just south of Detroit. They hope to alert drivers to information like if workers are present, what type of work is happening and when it will occur. The U.S. Department of Transportation is also testing this technology in three other sites: Wyoming, New York City and Tampa. “There’s a lot of potential just in the near term to help drivers be more safe,” Bonelli said. But, as with all new and untested technology, V2I has a dark side as well. Engineers are developing a kind of “WiFi” just for cars, using a part of the radio frequency spectrum the Federal Communications Commission set aside just for cars. The system for connected cars is called “Dedicated Short-Range Communication.” The way it works: a vehicle with the right kind of connected tech can send and receive signals to other cars or roadside units over the same broadband frequency if they are within 1,000 feet of each other. Bonelli said though 1,000 feet sounds like it’s too close, a car does not need information about what’s happening that far from its field of vision. Yet since connected vehicles are using these types of networks to talk to each other, it also leaves them more vulnerable to hacking, Pande said. BMW learned this the hard way when the German Automobile Association easily accessed information from its connected cars by setting up a fake cellular phone network the cars attempted to access. 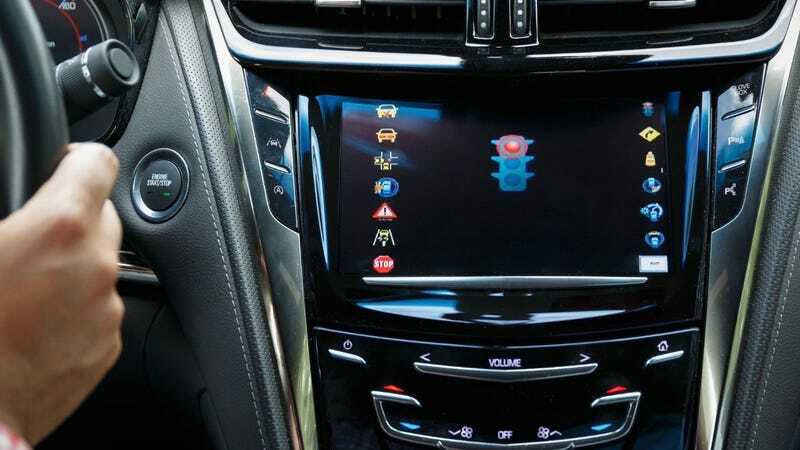 Though Bonelli stressed GM is taking the cybersecurity threats seriously as the technology moves forward, automakers as an industry only recently looked into privacy protection. Previously, GM took five years to fully protect its 2009 Chevy Impalas from hacks preformed by a group of researchers at the University of California at San Diego and the University of Washington. A survey administered by Massachusetts Sen. Edward Markey in 2014 found security measures to prevent hacking were haphazard among most automakers. The CIA’s even been investigating connected car hacking since that year. Now, companies like Ford, Toyota and GM formed the cybersecurity research group Auto-ISAC in 2015, but hacking into a connected car is still ridiculously simple. Carmakers are building connected tech first, while considering cybersecurity issues too late into development, say analysts at IT consulting company Capgemini. “Car brands have to adopt a mentality where at the earliest stages of R&D they are as comfortable considering cyber security as they are steering and braking systems,” Capgemini’s Magnus Gerisch stated. Of course, connected tech isn’t perfect. Like the introduction of the car itself over a hundred years ago, there is plenty of finessing to be done. But when done correctly, the systems being built today will save lives in the future. “If connected vehicles really penetrate the market, they will really reduce a lot of crashes, and take away a lot of crashes,” Pande said.